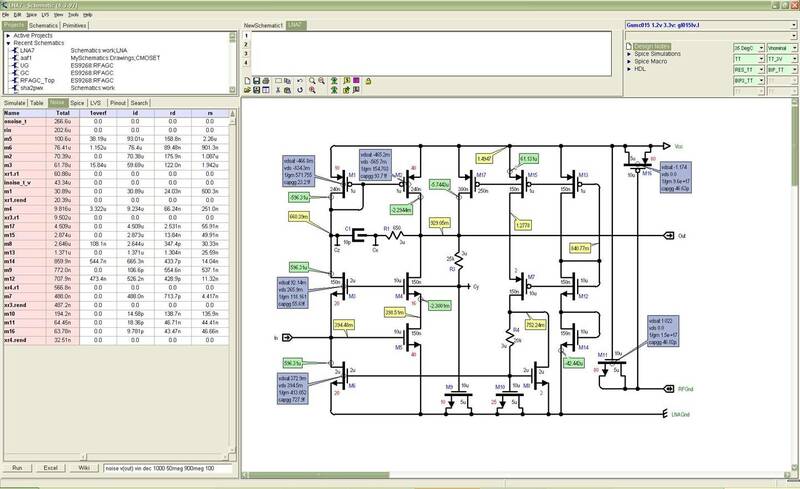 Schemata is a Schematic Entry System – use it to draw and simulate electrical schematics. 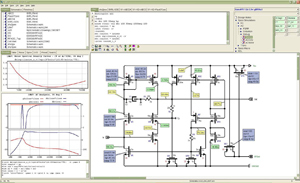 Schemata is not a prototype or PCB board design tool – it is a capable Analog IC design tool that can be used with most FAB semiconductor processes. The current version performs Spice simulation using Simucad’s SmartSPICE program to which it connects using low level Window’s functions (you need never see the SmartSPICE window) just point and click. Schemata is intimately connected to other MS Windows – all common cut, paste operations etc are supported. Schemata supports interfaces to LVS/DRC via LVS netlists, it reads StarRC layout files and provides post layout simulations and back annotations. 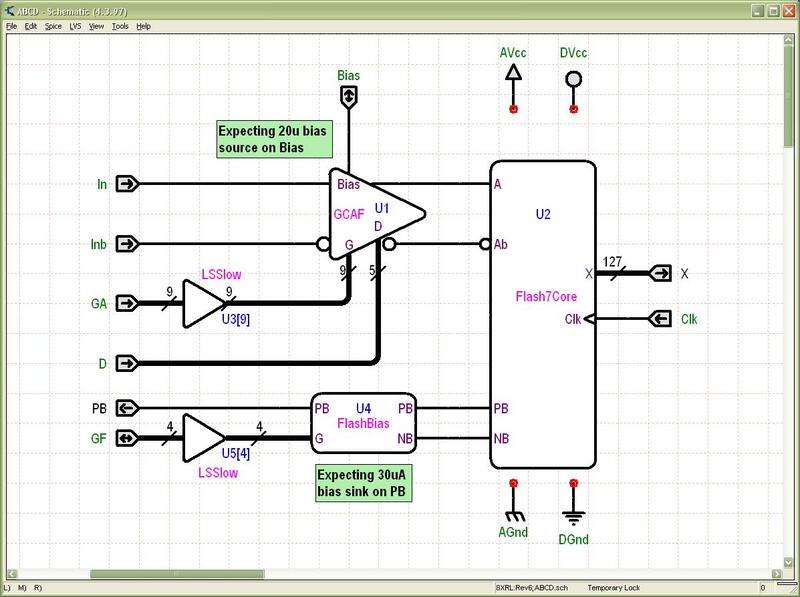 It is however only an Analog Design tool – use it for complex analog cells. Schemata is not compatible with any other design tools. Schemata does however write all the standard netlist formats (.sp, .cdl . etc) including a very nice Verilog format so you can still use it. You can certainly use Schemata to learn about analog design – it is extremely effective at rapidly developing and testing analog cells. 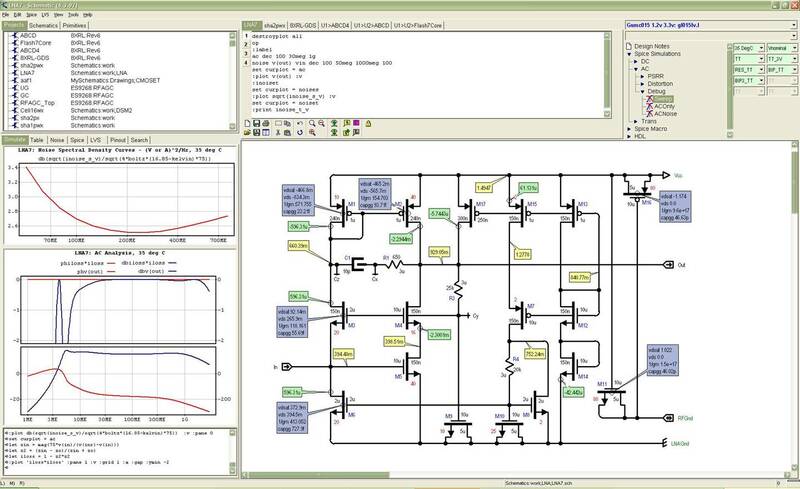 When you become familiar with Schemata you will find you can draw a new op-amp, plot response measure settling time and bandwidth in minutes if not in fact in seconds. Schemata supports a connection to a Wiki – currently Dokuwiki is used. Single clicks insert schematics, comments and simulation results into the Wiki as you proceed allowing a “documentation stream” to be built up in the background as you work. Later when viewing the wiki all links are to the real data – a click on a graph recovers the data to zoom in etc, a click on the schematic loads up Schemata and fetches the design to be edited. Schemata can use Excel as a net list definition tool. 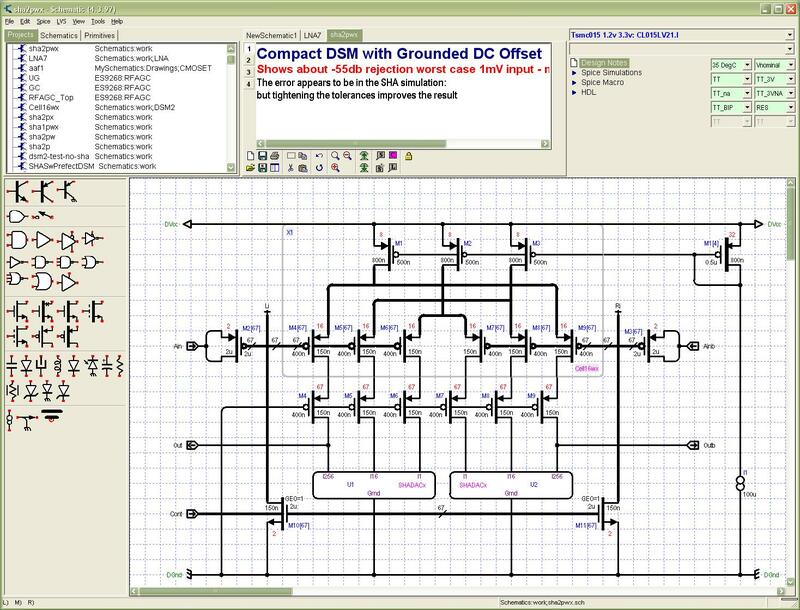 Because as Analog VLSI becomes common, designs on 90nm and less can exploit a new methodology of analog design: no longer constrained to hundreds of devices, analog designs can use tens of thousands of transistors and can achieve functionality through complex patterns of interconnection. It is essentially impossible to connect 8000 devices on a schematic in such a way that the pattern of interconnections impresses, for example, a quadrature (sine and cosine) pattern on a signal passing through the network, but it turns out to be reasonably easy to do this in Excel. Excel is a powerful tool – with a few macros and mouse clicks you can set up a complex interconnection of more than 100,000 FETS. Schemata uses MS tools to directly access Excel and translates the xls file into the netlist. Figure 1, Spice commands are executing in the bottom left window, the graphs show the results. Note the annotation of the operating points. The outline on the top right shows the simulation – we in one of the debug simulations in the AC tests of the device. The actual script running is shown in to the window above the schematic. Figure 2, A click on the “noise” tab shows the noise contribution of individual devices. 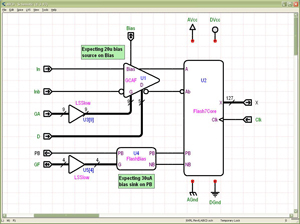 Figure 3, A slightly different configuration can be used when drawing the schematic – here the primitives are available to drag from a table on the left… note the transparent icon X1. 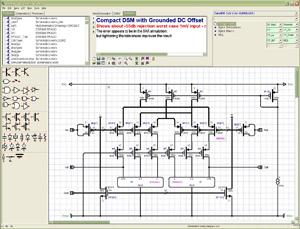 Figure 4, It is possible to work in a mode where the whole window is the schematic – this helps when reviewing a large design. "Allegro CL is outstanding in its ability to deliver flexible, extensible, and yet always backward compatible tools. It allows the ICanCAD system to be stable enough to hold a repository of valuable Intellectual Property, and yet sufficiently cutting edge to support the most innovative design engineers. 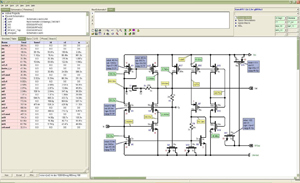 Allegro CL brings the full power of LISP to the engineer/design tool interface: this allows the skills of the most innovative engineers to be captured and dispersed to all engineering groups to enhance the business success of the company." "Allegro CL provides an extraordinary environment for rapidly prototyping new designs, circuits and ideas. The fact that the behavior of Schematic can be edited on the fly, via the built-in Lisp prompt, provides an unprecedented ability for the design engineer to customize the tool to suit their needs."